Dye wool fabric or yarn with geranium flower petals to produce a natural, chemical-free dyed color from plants in your backyard. Geranium flowers produce a blue-gray to brown-colored dye depending on the petal color and plant variety. Experiment with the flowers and make notes on the colors produced for future dying reference. Dye additional wool in a lighter shade by reusing the dye water after removing the first batch of wool. Prepare the wool by soaking it for one hour in a fixative solution made from four parts cold water and one part vinegar. 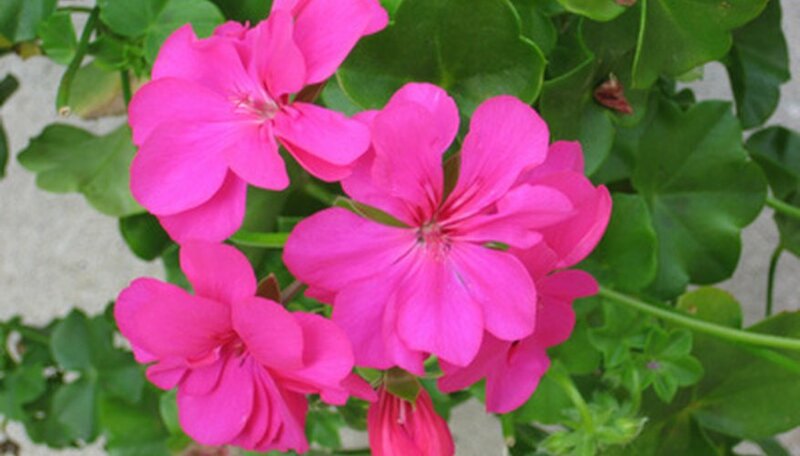 Select geranium flower heads that are in full bloom and free of pesticides. Remove the petals from the flower head and rinse with cold water to remove debris. Let the petals drip dry in a colander to remove excess moisture. Place the petals in a clean bowl and crush them with a large wooden spoon or chop with a clean scissors to release the pigments. Place the petals in a clean stainless steel pot and two cups of water for each one cup of petals. Bring the water to a boil. Reduce the heat to a simmer and let the petals stew for approximately one hour. Remove the petals from the water by pouring the mixture through cheesecloth or a fine weave strainer. Pour the dyed water back into the pot and add six cups water. Soak the wool in the dye for at least one hour or until it reaches a shade slightly darker than that desired. Turn off the heat and let the wool cool in the dye solution. Remove the wool from the dye pot and rinse in cool water until the water runs clear with no dye residue present. Gently wring out the wool and let it dry on a flat surface.